One of the coolest features on the ’66 Mustang was a player for 8 track tapes. It was also available on the Thunderbird and Lincoln models, but the Mustang was still the height of cool and the 8 track was as cool as it got. from the Auto Parts store. By ’67, 8 tracks were available on all Fords, home units and 8 track boom boxes were available, and you could buy 8 track tapes from most of the record companies at your local record store. 8 track tapes are an unusual design. Also known as Stereo 8, eight-track cartridge, eight-track tape, or simply eight-track, instead of being reel to reel like most other tapes, 8 tracks had only 1 reel. 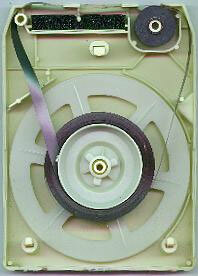 Tape was pulled out of the center of the reel to play and wrapped back on the outside afterward. A piece of foil was spliced onto the end of the tape and, as the tape was playing, when the foil passed by, the play heads shifter to the next tracks. There was a “clunk” or “carunk” sound and the music kept on playing. Since it was 8 tracks, and 2 at a time were needed for stereo, the tape heads could move 4 times before they were back at the beginning. At 11 minutes a run through, that gave you 44 minutes total play time. Sometimes the track switch fell between songs, but often songs had to be broken in two or padded with extra filler to help the track switch gap fall in the right place. The splice was the weak point on 8 track tapes. It held up for a while, but the heat of storing the cartridges in a car would dry up the lubricant and make the splice slip. They were repairable, but it took a lot of work if too much tape was unspooled. It wasn’t unusual to see broken 8 track cartridges with tangles of tape on the side of the road. Add another factor of cool, the 8 track players were initially sold as the Lear Jet Stereo 8 and were invented and designed by the company that made Lear Jets. Rights to the technology was eventually sold to other manufacturers. An enhanced version, Quadraphonic 8 track was released in 1970. It sounded great with 4 separate audio tracks, but it was very expensive and used by very few car companies. 8 track usage faded out slowly through the 70s giving way to the cassette. Cassettes were smaller, easier to store than 8 track tapes and took advantage of newer tape technology to produce a higher quality sound. Cassettes were in turn replaced by CDs in the mid 80s. Ughhh, writing this article makes me realize how many times I’ve spent $ on the same music.